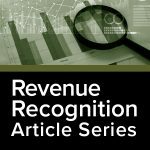 The purpose of this article is to provide an overview regarding the five steps outlined within the FASB Accounting Standards Codification – Topic 606, Revenue from Contracts with Customers (ASC 606) to determine when and how much revenue should be recognized. Approval and commitment of the parties. Identification of the rights of the parties. Identification of the payment terms. An entity may combine contracts and account for them as one contract, if the entity reasonably expects that such treatment would not result in a material difference from that obtained by accounting for each contract on an individual basis. In certain circumstances, the standards may require a series of contracts with a single customer to be accounted for as a single contract. They were negotiated as a package with a single commercial objective. Consideration to be paid in one contract depends on the price or performance of the other contract. Some or all of the goods or services promised in the contracts are a single performance obligation as defined in Topic 606. Additionally, ASC 606 contains new guidance on the accounting for contract modifications. Contracts can be written, oral or implied, but must be legally enforceable. A contract modification is any change in the scope and/or price of a contract, such as a change order, amendment or claim, that is approved by the parties to the contract. The accounting treatment depends on what was modified (contract scope, price, or both). Under the existing guidance (prior to ASC 606), contract modifications, such as unpriced change orders, are accounted for when recovery is probable and revenue is recorded when claims are probable and the amount can be reasonably estimated. Under the new standard, claims or change orders are recorded when there is a change in legally enforceable rights and obligations. This may be before the price of the change order is approved. Certain contract modifications are accounted for as a separate contract while others would result in treating the original contract and the modification on a blended basis. For the purposes of applying ASC 606, a contract would not exist if neither party has performed nor received consideration in exchange for promised goods or services, and each party can cancel without penalty. Per ASC 606, a performance obligation is a promise in a contract with a customer to transfer a good or service to the customer. If an entity promises in a contract to transfer more than one good or service to the customer, the entity should account for each promised good or service as a performance obligation only if it is (1) distinct, or (2) a series of distinct goods or services that are substantially the same and have the same pattern of transfer. Capable of being distinct—The customer can benefit from the good or service either on its own or together with other resources that are readily available to the customer. A good or service that is not distinct should be combined with other promised goods or services until the entity identifies a bundle of goods or services that is distinct. Each distinct good or service in the series represents a performance obligation satisfied over time. The same method of progress is used to measure the transfer of each distinct good or service in the series to the customer. Examples of services that may meet these criteria include engineering services, project management, software licensing, customer care programs, franchising, real estate and construction supervision. Note that a performance obligation does not include setup or administrative activities, which an entity must undertake to satisfy an obligation, unless those activities transfer a good or service. Variable consideration—If the amount of consideration in a contract is variable, an entity should determine the amount to include in the transaction price by estimating either the expected value (that is, probability-weighted amount) or the most likely amount, depending on which method the entity expects to better predict the amount of consideration to which the entity will be entitled. Constraining estimates of variable consideration—An entity should include in the transaction price some or all of an estimate of variable consideration only to the extent it is probable that a significant reversal in the amount of cumulative revenue recognized will not occur when the uncertainty associated with the variable consideration is subsequently resolved. The existence of a significant financing component—An entity should adjust the promised amount of consideration for the effects of the time value of money if the timing of the payments agreed upon by the parties to the contract (either explicitly or implicitly) provides the customer or the entity with a significant benefit of financing the transfer of goods or services to the customer. In assessing whether a financing component exists and is significant to a contract, an entity should consider various factors. As a practical expedient, an entity need not assess whether a contract has a significant financing component if the entity expects at contract inception that the period between payment by the customer and the transfer of the promised goods or services to the customer will be one year or less. Noncash consideration—If a customer promises consideration in a form other than cash, an entity should measure the noncash consideration (or promise of noncash consideration) at fair value. If an entity cannot reasonably estimate the fair value of the noncash consideration, it should measure the consideration indirectly by reference to the standalone selling price of the goods or services promised in exchange for the consideration. If the noncash consideration is variable, an entity should consider the guidance on constraining estimates of variable consideration. Consideration payable to the customer—If an entity pays, or expects to pay, consideration to a customer (or to other parties that purchase the entity’s goods or services from the customer) in the form of cash or items (for example, credit, a coupon, or a voucher) that the customer can apply against amounts owed to the entity (or to other parties that purchase the entity’s goods or services from the customer), the entity should account for the payment (or expectation of payment) as a reduction of the transaction price or as a payment for a distinct good or service (or both). If the consideration payable to a customer is a variable amount and accounted for as a reduction in the transaction price, an entity should consider the guidance on constraining estimates of variable consideration. For a contract that has more than one performance obligation, an entity should allocate the transaction price to each performance obligation in an amount that depicts the amount of consideration to which the entity expects to be entitled in exchange for satisfying each performance obligation. To allocate an appropriate amount of consideration to each performance obligation, an entity must determine the standalone selling price at contract inception of the distinct goods or services underlying each performance obligation and would typically allocate the transaction price on a relative standalone selling price basis. If a standalone selling price is not observable, an entity must estimate it. Sometimes, the transaction price includes a discount or variable consideration that relates entirely to one of the performance obligations in a contract. The requirements specify when an entity should allocate the discount or variable consideration to one (or some) performance obligation(s) rather than to all performance obligations in the contract. An entity should allocate any subsequent changes in the transaction price to the performance obligations in the contract on the same basis used at contract inception. Amounts allocated to a satisfied performance obligation should be recognized as revenue, or as a reduction of revenue, in the period in which the transaction price changes. The customer simultaneously receives and consumes the benefits provided by the entity’s performance as the entity performs. The entity’s performance creates or enhances an asset (for example, work in process) that the customer controls as the asset is created or enhanced. The entity’s performance does not create an asset with an alternative use to the entity, and the entity has an enforceable right to payment for performance completed to date. The entity has an enforceable right to payment for the asset. The customer has legal title to the asset. The entity has transferred physical possession of the asset. The customer has the significant risks and rewards of ownership of the asset. For each performance obligation that an entity satisfies over time, an entity shall recognize revenue over time by consistently applying a method of measuring the progress toward complete satisfaction of that performance obligation. Appropriate methods of measuring progress include output methods and input methods. As circumstances change over time, an entity should update its measure of progress to depict the entity’s performance completed to date.